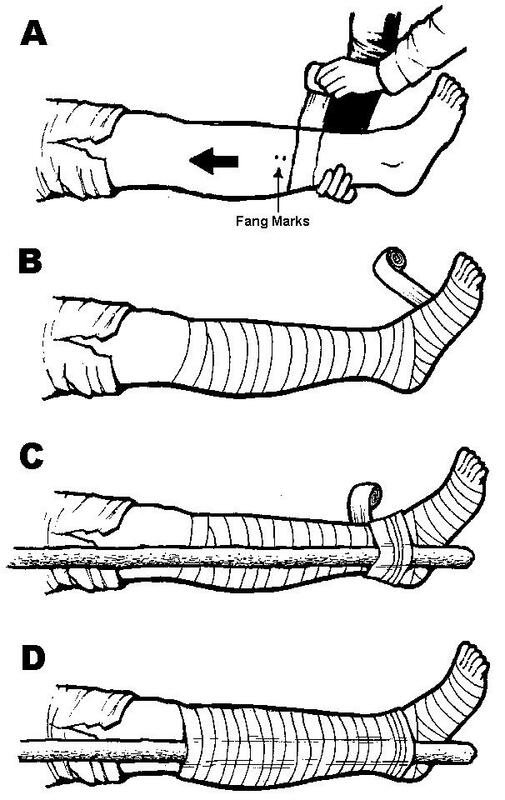 CAUTION: This snakebite treatment recommendation is for situations where medical aid and specialized equipment are not available. Nonpoisonous- Clean and bandage wound. Remove constricting items and minimize activity. DO NOT cut the bite site; DO NOT use your mouth to create suction. Clean bite area with soap and water and cover with a dressing. 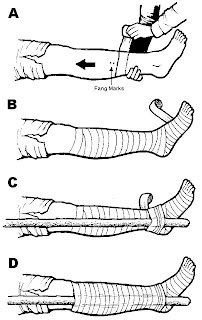 Overwrap the bite site with a tight (elastic) bandage. The intent is to slow capillary and venous blood flow but not arterial flow. Check for pulse below the overwrap. Splint bitten extremity to prevent motion. Treat the victim for shock. Position extremity below level of heart. Construct a shelter if necessary and let the victim rest. For conscious victims, force fluids. Take a picture of the snake, if available. If the snake is dead, remove the head and put it in a puncture proof container, if one is available for identification by medical personnel. Seek medical assistance as soon as possible.